Oil Lubricated Vacuum Pumps of superior quality and smooth performance are manufactured by us. Better-quality components and parts along with technically advanced machinery are used for fabricating the Oil Lubricated Vacuum Pumps. 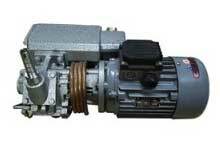 The Oil Lubricated Vacuum Pumps are small useful mono block pumps that find their wide applications in various areas. The Oil Lubricated Vacuum Pumps are highly popular among the domestic and international clients and are available at the most affordable rates in the market. SSM-25 25 27" 0.25 H.P. SSM-50 50 27" 0.50 H.P. Mainly used for laboratory distillations, screen printing, offset printing, power filling, labeling, packaging, conveying/holding, bottle filling, food industries, sealing machines & Pharmaceuticals, etc. SSV-50 50 28" 10 0.25 H.P. SSV-75 75 28" 10 0.25 H.P. SSV-150 150 28" 10 0.50 H.P. SSV-300 300 27" 10 1.0 H.P. Widely used for semi automatic capsule filling, filtration, conveying/transferring/holding applications, and for packaging and sealing machines. SSV-500 500 660 2 H.P. SSV-1000 1000 660 3 H.P. SSV-1500 1500 660 5 H.P. SSV-2000 2000 660 7.5 H.P.